Left - Exterior HEAVY GRAPE VT. - 7.25 in. diam. C. Philip Burton. 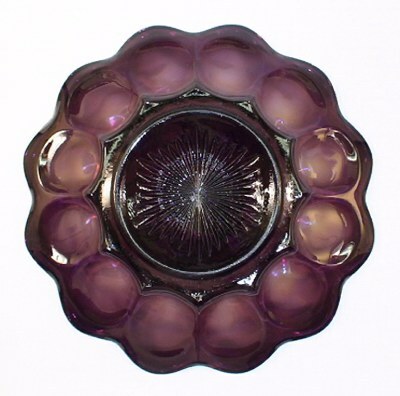 Right - Interior - HEAVY GRAPE VARIANT. 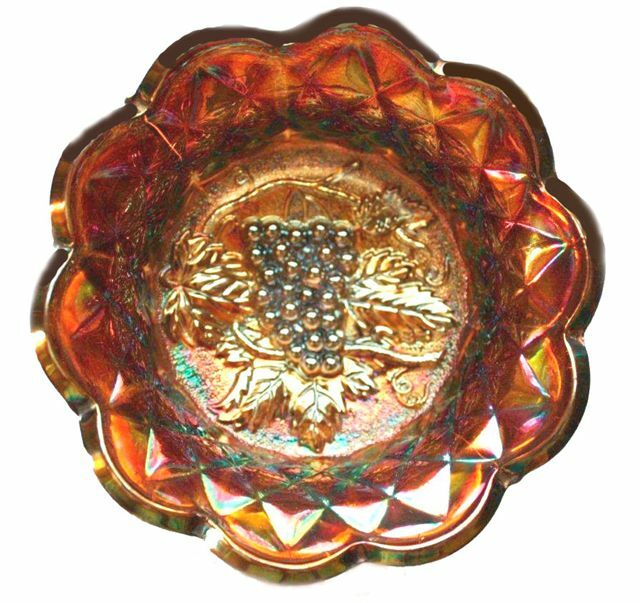 Base and side view of HEAVY GRAPE Variant. 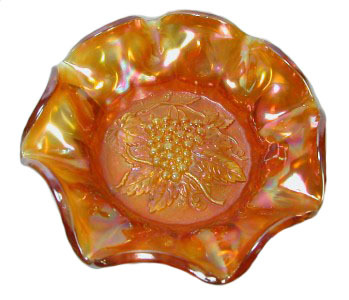 HEAVY GRAPE VARIANT Bowl, Marigold: There seems to be no question about the difference in edge treatment and the absence of “quilting” on the exterior of this bowl, as compared to the Heavy Grape with quilting. 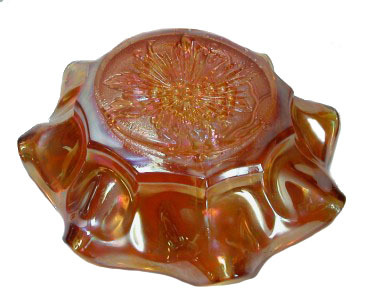 The central grape design is the same on both pieces. Eight inch HEAVY GRAPE VT. Plate - Purple - Courtesy Philip Burton. HEAVY GRAPE Berry Set - brushed on iridization. Courtesy J & C Curtis. 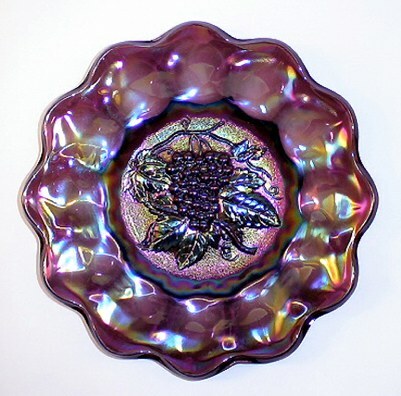 Large Heavy Grape Berry Bowl - brushed on irid. Courtesy J & C Curtis. 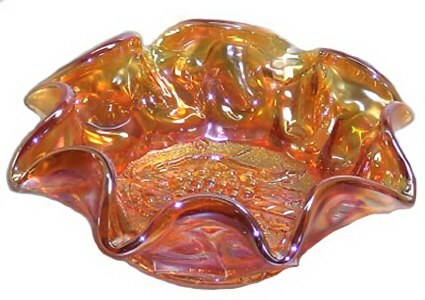 Small Heavy Grape Berry Bowl - brushed on irid. Courtesy J & C Curtis. brushed on irid. Courtesy J & C Curtis. 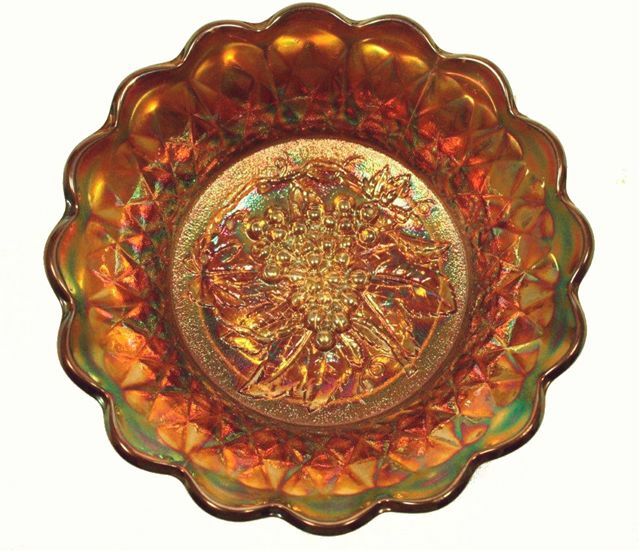 Frank took one of the small bowls back to the Fenton Factory and verified the treatment was indeed brushed onto clear glass stock, probably in an effort to clear the overstocked shelves of clear glass examples and move it to the retail market where it would sell much more quickly with the iridized treatment. He used some sort of spectra-scope where he said the brush strokes are clearly defined on the surface of the glass. He further stated that due to the labor intensiveness of the process, he doubted there were too many pieces marketed using this process. 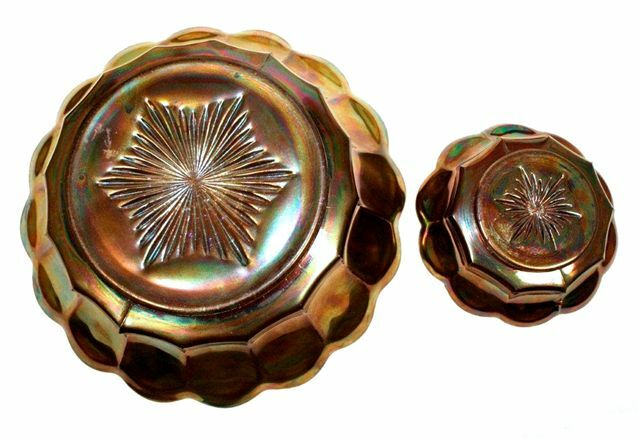 As the individual bowls are examined, it becomes obvious they were brushed or daubed with the iridizing dope, rather than having been sprayed. 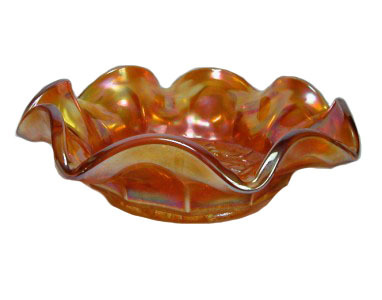 The photo showing the exterior, clearly displays the “applied amethyst” coloring, while the interior of the large bowl offers a more marigold sprayed application of color. 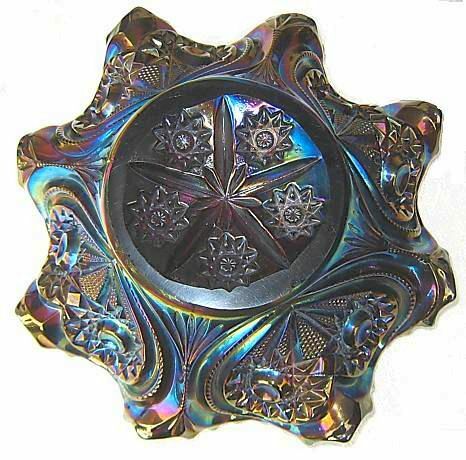 Jerry and Carol say the interior of the small bowls appear to have more blue coloration. The overall treatment of these pieces would involve two firings. ZIPPERED HEART Berry Set. 9-10 in. and 5 in. Bowls. ZIPPERED HEART Large Berry Bowl - Exterior. ZIPPERED HEART: Purple and marigold are the only reported colors in this pattern. 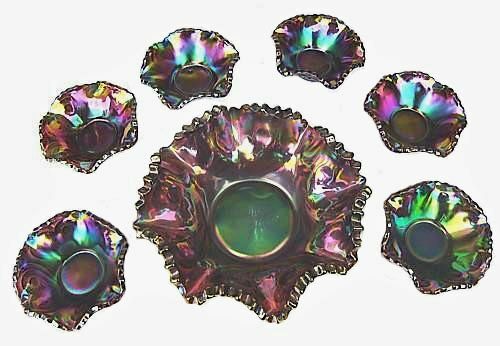 The ruffled berry set, comprised of a 9”-10” bowl and six 5” counterparts are the most available shapes, although these are rarely found. Imperial catalogs gave it the number #292. 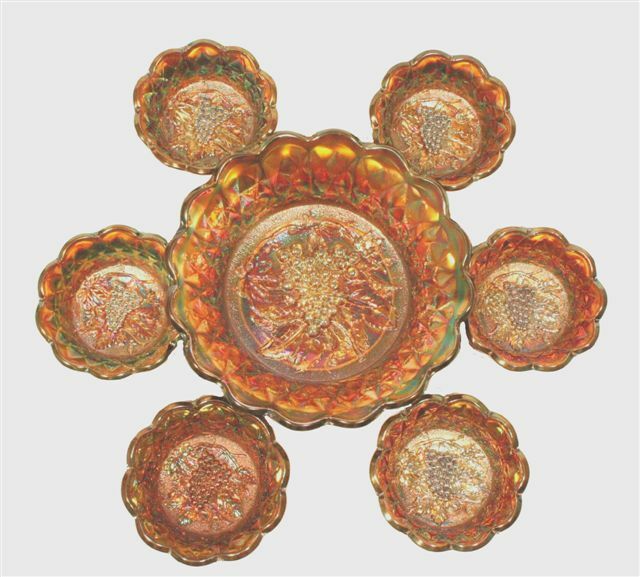 Other known shapes in this elusive pattern: Queen’s vase in purple and emerald, Giant rose bowl in emerald, 5” rose bowl in marigold and a 5” vase in marigold. These 4 items are quite rare. He who did not spare His own Son, but delivered Him up for us all, how shall He not with Him also freely give us all things? Who shall bring a charge against God’s elect? It is God who justifies. Who is he who condemns? Who also makes intercession for us. Who shall separate us from the love of Christ?